Why did I want to eat at Essensia? Well, it was a beautiful evening, and I wanted to sit outside. I was in the mood for something special and ready to loosen the purse strings. And I needed something new. I'd read chef Jiří Štift recently started cooking at the Mandarin Oriental and had introduced a new menu. He used to cook at Alcron in the Radisson SAS. We ate there years ago when he ran the kitchen and greatly enjoyed it. 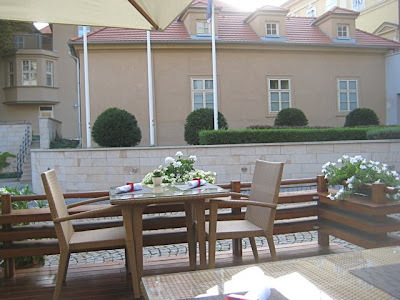 So we got to the hotel in Malá Strana as the sun was setting and sat out on the wooden deck. The tables looked inviting, with flowers and plants around them. It was only mildly disturbing that cars and taxis regularly drove past. The deck is in the hotel driveway. Things started off well, service-wise. 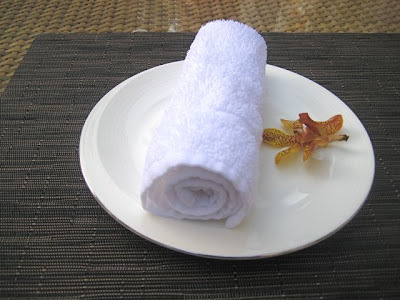 Our super polite, somewhat overly attentive waiter brought us refreshing, cool towels. There was a real, little orchid on the side. We ordered a .75 liter bottle of Mattoni (190 CZK). 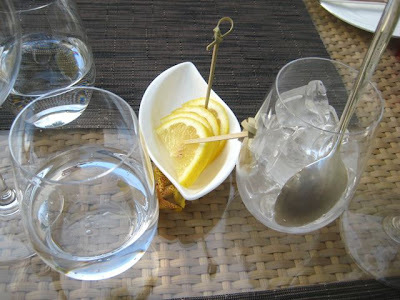 The waiter brought a separate glass of ice and slices of lemon with fancy toothpicks, a nice touch. I expected five-star hotel prices, but I was still surprised how much they jack up the cost of drinks. We were waiting for Jersey Girl, our faithful foodie friend, to join us, so I ordered a gin and tonic. V had a Campari and orange juice. I got a separate little bottle of tonic, which cost 110 CZK. The shot of Gordon's gin was 160 CZK. I didn't know the prices until the end, but I was pretty stunned when I found out it was 270 CZK for a basic long drink. V's Campari, by itself, was 150 CZK. The juice was fresh-squeezed and cost another 120 CZK. That's 270 CZK altogether. She thought they used too much Campari, making it too bitter for her taste. I don't know about everybody else, but the practice of charging separately for alcohol and mixers puts me off. 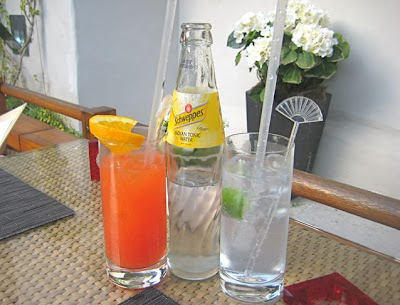 And compared to the Mandarin Oriental, the Buddha-Bar's gimlet seemed a relative bargain at 190 CZK. We were hungry and had to ask for bread. It took a long time for it to arrive. 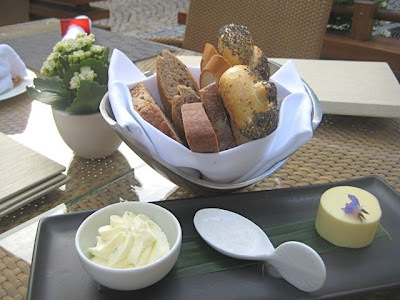 The waiter apologized profusely that the bread he had sent to us had been given to another table by mistake. There was some OK stuff with walnut mixed in, but the poppy seed rolls were on the stale side. The other slices were unremarkable. There was whipped garlic butter and regular butter on the side. The waiter disappeared for quite a while and when he came back, we had trouble getting his attention. Finally, we did. But we didn't consider the newly unveiled gourmet Czech section of the menu. If you are interested, it's not on the internet. Except for here if you can read it. We were all in the mood for their Asian offerings. I was the only one who ordered a starter. 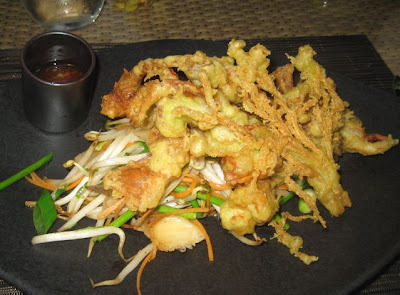 I got the soft-shell crab in wasabi tempura (480 CZK). It was a large portion of crab, easily double the size of the cheaper version I had at SaSaZu. The delicate meat was fresh and delicious. The tempura shell was perfectly crunchy, but I was disappointed I couldn't detect the wasabi. On the side was the basic Thai chili sauce you can find in any supermarket. I expected something a little more creative from a big name chef at a fancy hotel charging top-end prices. Under the crab was what was described as "soy bean and shiitake mushroom salsa." I'm not sure what made it a "salsa," but I found it very dull and uninspired. It was overwhelmed by the earthy flavor of the bean sprouts. I'm really not a fan of sprouts, so I asked Jersey Girl for her take. She's generally a vegetarian who eats fish sometimes. Her opinion: "Nothing special." 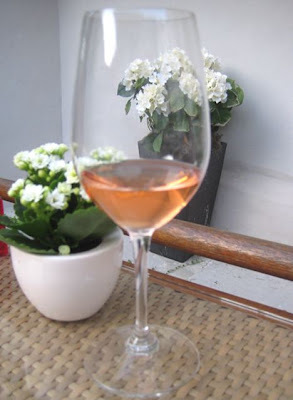 We wanted a chilled bottle of rose wine with our summer meal, and I was disappointed that there were no French options in that category, only Czech. I ordered the Svatovavřinecké Claret (820 CZK). I was unimpressed. I found it far too sweet and not so refreshing. At this point, between the starters and the main courses, our waiter disappeared again. In fact, the whole outside staff went AWOL. I'd guess it was for close to 15 minutes. We wanted another bottle of water. When he came back I got his attention. "I'm so sorry. A number of tables were seated inside, and we have to take care of them as well." We ate inside a few years ago, right after the hotel opened. We thought the food was pretty good then, if overpriced, and that the white-washed walls and stone floors gave the dining room a cold and uninviting atmosphere. Anyway, on to the main courses. At the beginning of the evening, V saw a gentleman outside eating lobster, but didn't see it on the menu. She asked and was told it was a special, unlisted dish. The waiter checked for her and said there was one portion left. Nice. 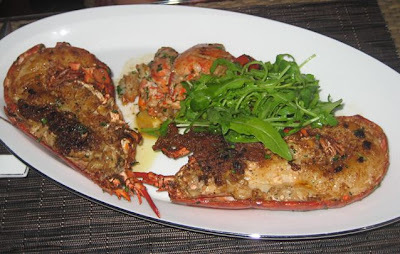 So she had the grilled lobster (950 CZK). This was a dish that was worth the price. It was split and fried in a healthy amount of butter, with just the right level of salt and other spice. The meat was fresh and tender. She enjoyed it greatly, and the few bites I got were delicious. There was a small amount of grilled vegetables on the side, which she said were not too remarkable. I ordered the pepper-glazed beef entrecôte (590 CZK). 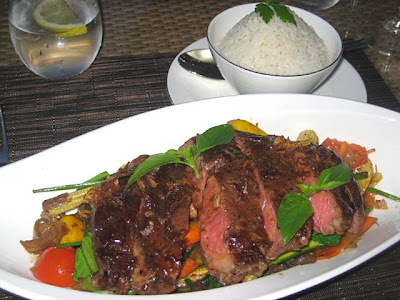 The meat, cooked medium-rare, came with stir-fried vegetables and jasmine rice. There was a slightly sweet but thin teriyaki-style sauce over the meat, which pooled under the vegetables. I wasn't sure how to cut it without mashing the steak down on the veggies -- there was no separate plate. When I began cutting, the beef seemed a little tough. When I began chewing, it tasted well-seasoned and grilled. But it was also very tough. And gristled. My jaw began getting tired. And I started to get annoyed. This was not good quality, well-sourced beef. This was not worth almost 600 Czech crowns. I could get a far better steak down the road at El Barrio de Ángel for half the price. There was a nice mix of vegetables underneath -- cherry tomatoes, baby corn, peppers, zucchini, and such. But sitting in the uninspired sauce, they didn't bring me much joy. 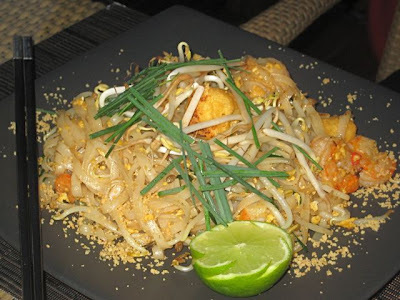 Jersey Girl had the Phad Thai with shrimp (490 CZK). It has to be one of the most expensive versions in the city. And it was perhaps the worst iteration I have tried. "It's really sour," Jersey Girl told me. I took a bite. "Oh yeah. Intense. But it also reeks of fish sauce. Really skunky." I love a few dashes of fish sauce in Asian cuisine. We use it quite often at home. But this tasted like they dumped a whole bottle in the mix, along with a crate of limes. To make matters worse, there were only four medium-size, over-cooked, dried-out shrimp, along with some microscopic ones. The noodles were dry and clumpy, too. The table next to us was talking and considering ordering the phad thai. JG said with a stage whisper, "Don't do it!" Down the street at Noi, you can get a far-superior phad thai with six properly cooked shrimp for just 240 CZK. We weren't happy, and we wanted out. But our waiter had disappeared again. The sun had gone down, there was little lighting on the deck, and we were sitting in the dark. Fuming. "I'm so sorry," he apologized when he finally turned up again. "It was very busy inside. Can I offer you some free coffee or would you like dessert?" "No, just the check. Time to go," I said. We had no desire to stay a minute longer than we had to. The finally bill was 4250 CZK. Jersey Girl kicked in 1000 CZK, and I picked up the rest. Serious money. Contrary to the misapprehensions of some out there, I don't get free food. When I eat at an expensive restaurant, I pay for the meal out of my own pocket. I can afford a pricey meal, but I do maintain the expectation I will get value for my money and good service. After this dinner, I was angry. The lobster and part of the crab dish were enjoyable. But that's not good enough. The steak and the phad thai were failures. I did not like the wine. The mixed drink prices were outrageous. The service was just plain "sorry." I was embarrassed I had invited a friend to share in this learning experience. You'd think a place called Mandarin Oriental would take their Asian cuisine more seriously. But after dining at Essensia, I was nursing the feeling that I'd been bilked out a fair amount of cash. 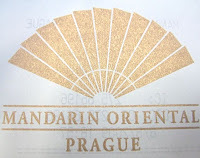 If you are looking for a fine Asian meal on the town in Prague, there are plenty of far wiser choices you can make. Thanks for the review. I almost went to Essensia when they had the Indonesian special menu but it didn't work out in the end. Thank God I didn't go, or else I'd have been disappointed. 820 kcs for Svatovavřinecké rosé??? (BTW, "Clarets" are certain reds, not rosés; I hope their menu isn't saying otherwise, though having read your review, I would hardly be surprised). 270 kcs for a G'n'T (and only Gordon's, at that)??? Not even mentioning the shoe leather steak (590 kcs???) made even worse by the fact it's served directly on top of veggies making cutting that much more difficult. I've often wondered who are the bigger idiots in this town; those who own the "restaurants" and think they can get away with this crap or we the customers who quite clearly often put up with it. After all, this is not your local pub spooning up mediocre-to-good fare; you can forgive a lot for 100 kcs. No, this is yet another operation pretending they are giving you a top-notch experience -- THAT's even worse than the expense. 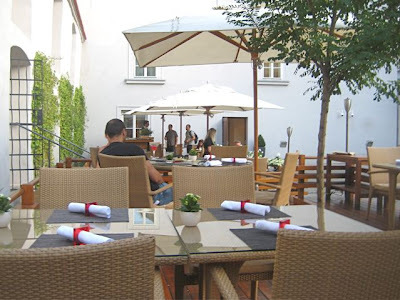 I have to say that I am a fine dinning enthusiast and I would say that Essensia has the best Massala in Prague, I would also have experience of excellent service especially from the female members of staff in the restaurant. I have to say I was dissappointed with the apalling english used to write this review and feel that it is unfortunatly that a clearly American review can cast such unrealistic portrayles of European restaurants, thankfully in Europe we know better.I will continue to enjoy Essensia's fine cusine for years to come.